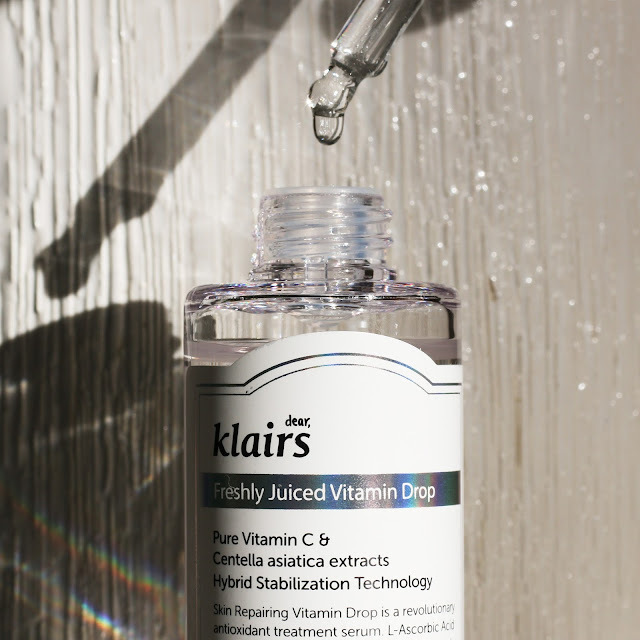 The Freshly Juiced Vitamin Drop is a newly released antioxidant serum from Klairs. It consists of pure Vitamin C, which is supposed to rejuvenate and brighten your skin. It is known that one of the most effective ways to lighten hyperpigmentation is by using Vitamin C (aka L-Asocorbic Acid / LAA). Your DNA and skin cells get destroyed by free radicals, which are created through pollution, UVA/UVB and smoking. This leads to skin hyper-pigmentation, premature ageing (e.g brown spots and wrinkles). In the past, I have tried the C20 Pure Vitamin C 21.5 Advanced Serum however never wrote a review on it because it didn't work very well on my skin. There are plenty of these serums out on the market, but if the percentage of Vitamin C is really high, it can provoke skin irritation. 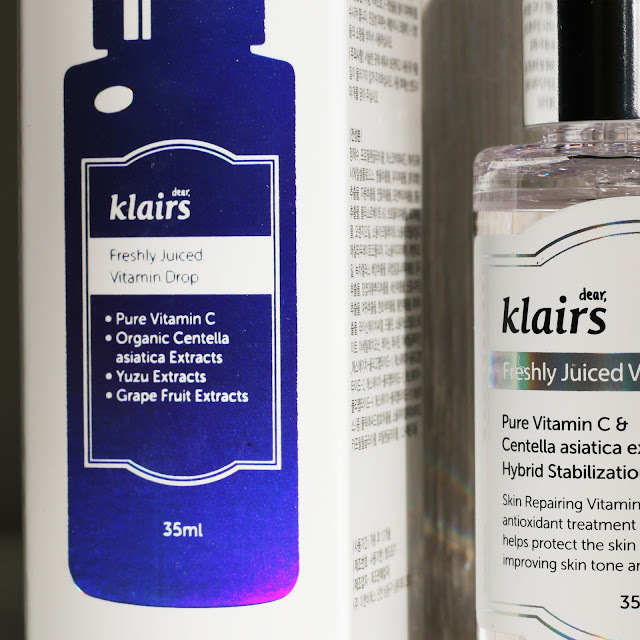 Klairs came out with this Freshly Juiced Vitamin Drop and it's recommended for those with sensitive skin (and also those who are prone to acne). This is because it only contains 5% of Vitamin C, which may make the product seem ineffective. However, it's gentle, meaning that there's a lower chance of irritation and your skin will recover gradually. The issue with Vitamin C is that it can oxidise really easily. Oxidisation makes the product become useless and can actually damage the skin, so it's best to use the product up within 3 months of opening it. If you see colour change (the product becoming yellow/orange), it would be best to chuck it out. My normal/dry sensitive skin is usually in a good condition because of my skincare routine. Now that I've been using this product for around two weeks, I haven't really noticed a dramatic change. I did have one or two light scars from picking my pimples (I always tell myself not to do this...), but they have pretty much faded now. I'm not 100% certain they faded quickly due to this product, however it may have helped in one way or another. 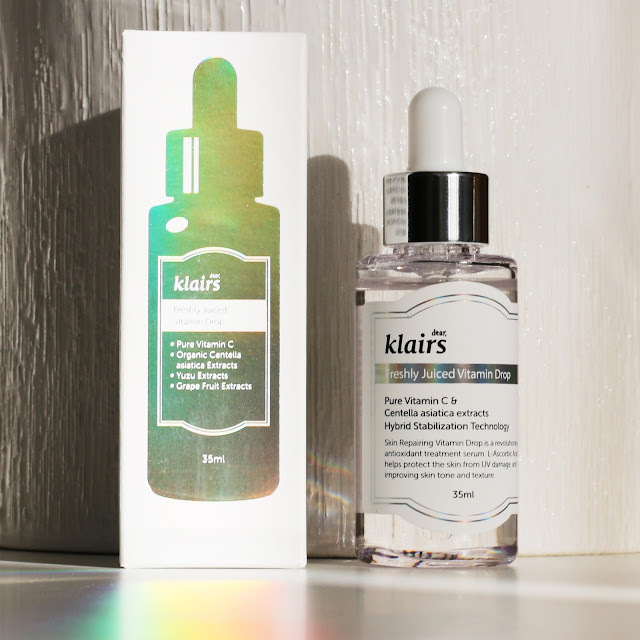 Most of the Klairs products come in a brown/black/white/green packaging, so I was shocked to see the difference in design. The Vitamin Drop bottle looks simple, beautiful and luxurious. It also comes with a pipette, so it's really easy to control and dispense the amount of product you want. There are instructions on the box, bottle and the website, which I kind of followed. The first few times I used this, I mixed 2 drops with my moisturising serum and applied it before my face cream. The consistency of this is slightly runnier than oil and I find that it adds extra moisture to my skin. When I started to use it by itself (before my moisturising serum), I found that it dries more rapidly. Overall, it's too early to claim that this Vitamin Drop has substantially improved my skin tone and texture. I think it's a nice product, but since I already have so many steps in my skincare routine and I don't suffer from a lot of hyper-pigmentation on my face, it's a product that I don't desperately need. I will definitely keep using it though and if I do fall in love with it, you guys will know in the future. *Disclaimer: although this post is sponsored, all opinions are my own. By the way, if you're planning to make a purchase from Wishtrend, use this link when you sign up to receive a $5 off coupon code. N-HYC All rights reserved. Powered by Blogger.